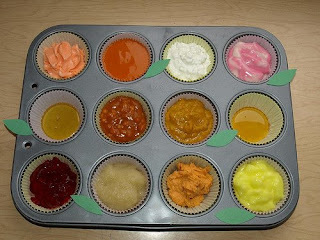 Be Brave, Keep Going: Muffin Tin Monday - Theme: Foods You Can Eat With A Straw! 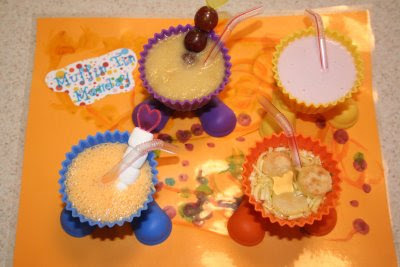 Muffin Tin Monday - Theme: Foods You Can Eat With A Straw! Want to participate? Blog about your muffin tin meal (or post it to the flickr group) and come back here and leave me a comment with the URL. Looking forward to seeing what you come up with! I wanted to share with you that I recently found your blessed blog...and started my own. I have a 2 yo and a baby...always looking for simple crafts. I am also a Christian. So I have lots to learn from you! I look forward to reading your cancer story...that sounds weird, sorry. Feel free to come check us out. The blog is mostly about my children, with bits of Meghan's speech disorder and crafts thrown in. Anyway, just wanted to say hello. I look forward to getting to know you more! We opted to make a mid morning snack for Muffin Tin Monday. Maddie loves anything with a straw so of course it was a big hit! Thanks! How fun, I've been looking forward to this week's post to see what everyone did! I love how you did the taste test too. And now I want an icee, hehe! Wow! Nice job everyone! I was unable to pull this one off since I didn't look at the theme until today. My bad. It's fun to see what everyone else did! We had so much fun with this & made a whole day of it... I finally caught a chance to put up a picture & our story here - come see! Great idea of having them guess what they were "drinking". Looks like fun! I always have great intentions of getting my muffin tin in by Monday, but the last couple of weeks I have failed! I even had the idea of doing a smoothie sampler and making different kinds of smoothies to try. I'll TRY REALLY HARD to join in next week!